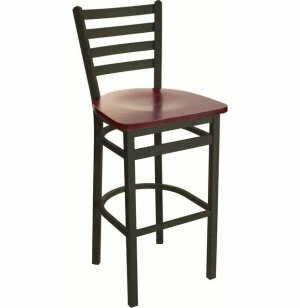 Seat your patrons in comfort and style with these metal bar stools from Barsky Fleming. Their classic design and welded construction make them a great choice for any office, commercial or campus eatery. Ladder-style back and sleek lines give these bar stools a contemporary look that can be adapted to almost any existing décor. The highly durable, 18-gauge steel frame is fully welded. The black sand, powder-coated finish offers you a frame that resists peeling and scratching. Plastic glides protect flooring from scratches and marks. 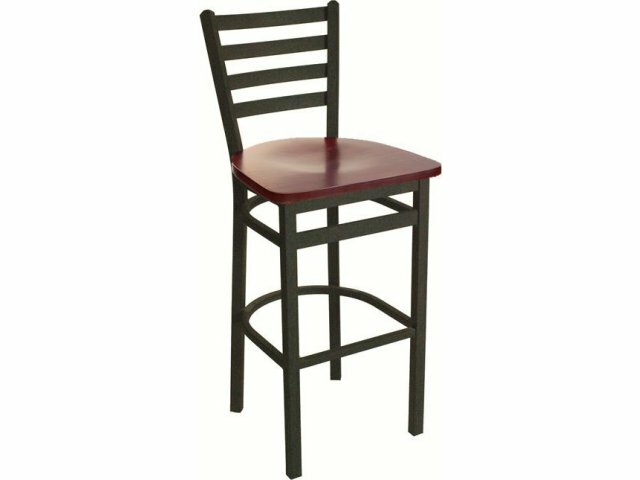 Available in a choice of veneer-finish seats that let you create the look that suits you best, these metal bar stools are the perfect addition to any food-service establishment. Welded Construction: All-welded construction is highly durable. Sleek Design: Ladder-style back and curved black legs give this chair a great look. No-Peel Frame: Powder-coat finish resists peeling and scratching. Flexible Style: Choice of seat colors lets you achieve the look you want.